Hi, I’m Miguel, blogging directly from Cuba. I hope you'll enjoy reading my blogs as much as I enjoy writing them! Finally the time has come for many to travel legally to Cuba. The quintessential Cuban parranda is the one in Remedios in the central Sancti Spiritus province. Its Christmas festival takes place from the 16th to 26th of December, but the main event is on the night of December 24th. Dating back to the year 1820, the legend says the parranda was started by Father Francisco Vigil de Quiñones, priest at the Iglesia Mayor of San Juan Bautista de los Remedios, because he sent kids on the street to make as much noise as possible to make locals go to Mass. The celebration later evolved into a healthy competition between the two neighborhoods of El Carmen, represented by a hawk symbol and San Salvador represented by a rooster symbol. Each neighborhood spends the whole year building fireworks and floats representing them. 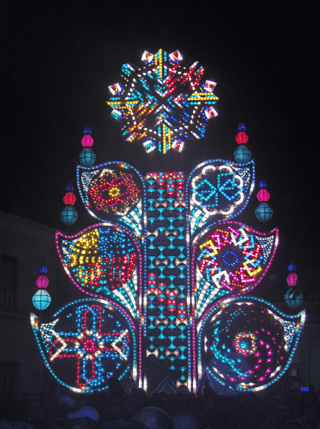 The floats, full of lights, are beautifully decorated according to pre-established themes and are then shown on the night of December 24th in Remedios’ smoked filled central square. Around 8pm, both neighborhoods make their “salutes” by filling the night sky with fireworks and showing their banners and symbols. Firework filled racks and mortar cannons are fired intermittently for most of the day and night announcing different events of the parranda or just for the sake of competing. Rumba dancing and congas fill the streets with non-stop music and sounds of explosions until early the next day. It is a party you never want to see the end of. 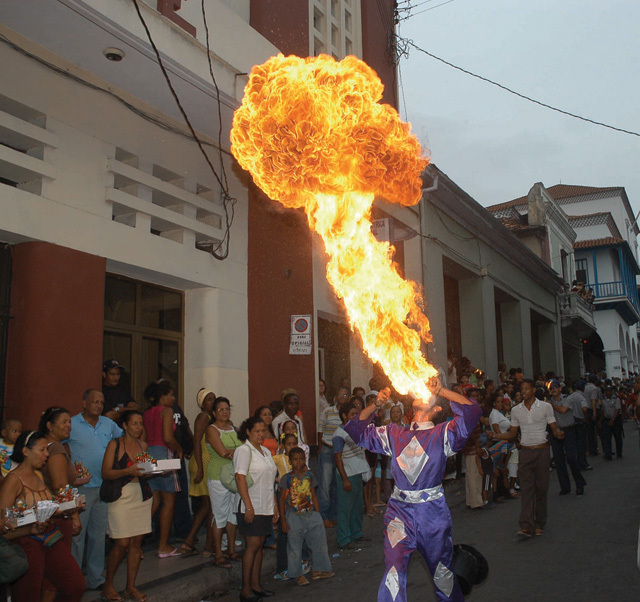 The Fiesta del Fuego in Santiago de Cuba is one of the best cultural events in the east of Cuba. Originally conceived as an academic gathering for the celebration of conferences, workshops, and talks on the culture, dance and music of the Caribbean area, the Fiesta developed into a street party festival taking place from early morning to late at night for a whole week in July each year. The festival is dedicated to one particular country each year. There are parades and dancing from every country of the Caribbean participating, as well as street vendors with local food, drinks, and crafts. The throbbing sound of music coming from bands is constant throughout the day. You can just stand by and admire the never ending dances, featuring traditional and international styles mixed with religious and cultural customs or join in the massive street party. Back in 1998, a bunch of my friends and I, who were then studying our senior year in college, heard about a gathering with non-stop electronic music for three straight days at La Rotilla, a beach located in the northern coast of Havana near the town of Santa Cruz del Norte. We packed a couple of things and left. I remember we spent a night at the old Hershey train station in Regla to catch the train to Matanzas. We spent the night on a slow train and arrived at Santa Cruz in the morning to be received by one of the most beautiful sunrises I’ve ever seen. As we walked along the road, we passed the Santa Cruz rum factory and at a curb on the road, with no signs, we stepped into the wild and after some more walking finally reached our destination. There were small makeshift tents and a hundred people sitting around, jumping off a small cliff into the blue sea and others dancing to the rhythm of techno music. We spent a couple days there and left half eaten by mosquitos and hunger, but it was still an unforgettable experience of shared camaraderie and fun. Ten years later, better organized and sponsored with a variety of activities and musical genres, the Rotilla Festival, now held at Jibacoa beach, boasts a different look. Featuring several stages or arenas, the festival includes the presentation of leading DJ’s and VJ’s in Cuba as the main motif, along with talks and debates on youth-related topics. The “Electro Stage” presents non-stop performance of the best Cuban DJ’s. The larger “Arena Stage” is for alternative genre bands performing at night. The “Cinema Stage,” as its name indicates, presents independent short films and serves as space for debates, among other things. There are also the newest “Fusion” and “Info” stages for more selective audiences and information on the festival. Considered by some as a “hippy/drink-all-you-can/get-crazy celebration,” most of the hundreds who attend take the good stuff and forget the bad for the sake of having fun and making new friends. It’s something different compared to the rest of the events in Cuba.